Thanks in part to the skills of our scientists and animal care professionals, Disney's Animal Kingdom has been the birthplace for many animals that are threatened or endangered in the wild. Since 2002, the park has celebrated the births of a black rhino, an okapi, a gibbon and a siamang. 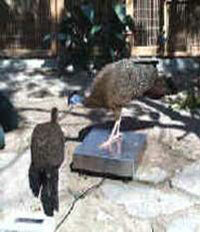 New arrivals in 2003-2004, included four gerenuk, and three marabou storks. 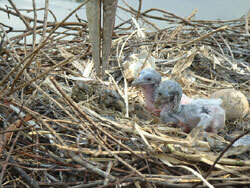 The hatching of five Micronesian Kingfishers is of special significance to the survival of this species. There are only sixty-eight of these tiny birds left in the world! Our Elephant Family Continues to Grow! 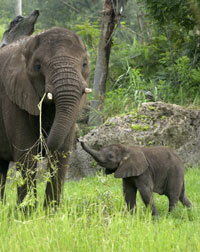 Without a doubt, the "biggest" news has been the birth of three African Elephants in the past three years. It started in May 2003 when a male, "Tufani" (a Swahili word meaning "storm") was born, followed by "Kianga" (Swahili for "sunshine") a female arrived in July 2004. 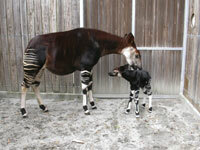 Most recently another female "Nadirah" (Swahili for "precious gift") was born in December 2005. Kianga and Nadirah were the result of natural breeding, while Tufani is one of only four surviving African Elephant calves born in North America as a result of artificial insemination. 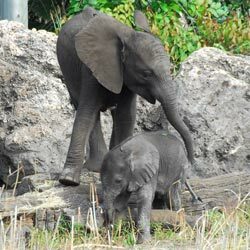 The elephant breeding program at Disney's Animal Kingdom is part of the Association of Zoos and Aquariums (AZA) Elephant Species Survival Plan (SSP), a consortium of zoos and wildlife parks working cooperatively to conserve elephants. time on the savanna with his mother Moyo. Since African Elephants are endangered and difficult to breed, these births are significant milestones for both the species and the Disney team of elephant managers, scientists and veterinarians. The three youngsters now spend much of their time out on Disney’s Animal Kingdom savanna - always under the watchful eye of their mothers and fellow herd members. Click here to see a sonogram of one of our baby elephants! Nadirah, discovers the sights and smells of the savanna with the help of older playmate Kianga. Both were born at Disney’s Animal Kingdom as part of a global breeding program established by the Association of Zoos and Aquariums. The animal care team focuses much of their time on conditioning animals to be comfortable with various husbandry techniques. They use positive conditioning techniques to train the animals to voluntarily cooperate with their own medical care. For example, the big cats open wide so keepers may examine their teeth, gorillas extend their arms for vaccinations, and even the storks step on scales to be weighed. The animal care team also conditions the animals to return to their barns at night when hearing a specific tone, which ensures that animals can be visually checked every night. Another critical aspect of animal care is enrichment. This means encouraging natural behaviors by providing incentives for animals to make choices, be active, and explore. This can be accomplished with the design of habitats, introduction of new landscape items, toys, and unique scents. For the record, "cheap" perfume is a favorite for the tigers of Anandapur! The animal kitchens at Disney's Animal Kingdom and the Living Seas also play a large role by providing spices, flavorings, and other scents. Animal caretakers can spread these throughout the habitats so the animals can investigate and discover new things in their habitats every day. 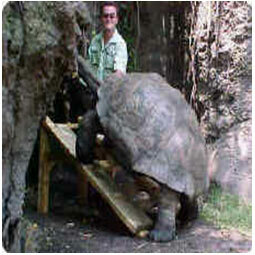 Training this Galapagos tortoise to stand on a ramp, allows keepers to check the underside of its shell. Just one example of how training is enhancing animal care at Walt Disney World. 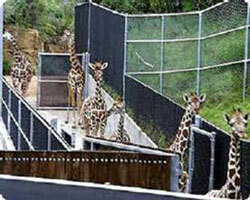 Using a variety of sound cues, animals like these giraffe are trained to come into their night time housing. This allows keepers to get a closer look at the animals and safely maintain their outdoor environment. Since weight changes can signify health problems, Argus pheasants and many other species are trained to stand on a scale, so their weight can be monitored.